The Roux-en-Y gastric bypass procedure has been the gold standard for surgical weight loss intervention for many years in the United States. In 1991, the National Institutes of Health first recommended Roux-en-Y gastric bypass surgery for patients who had a Body Mass Index (BMI) between 35 and 39.9 and suffered from any obesity-related health condition, or people who had a BMI of 40 or more, regardless of health. Roux-en-Y gastric bypass has a long and distinguished track record in the United States, setting it apart from other bariatric procedures that have come and gone. Numerous multi-institutional long-term studies demonstrate that Roux-en-Y gastric bypass surgery improves health, enables long-term weight loss, and improves life expectancy. *results may vary. How Is Laparoscopic Roux-en-Y Gastric Bypass Performed? In most cases, the procedure can be performed by Western Bariatric Institute’s expert surgeons in about one hour. The procedure involves making five small incisions, each of which is approximately 1 cm in length. A small camera, called a laparoscope, is inserted into the abdomen, and the surgeon works to create a stomach pouch from the larger stomach body (aka stomach remnant). A portion of the small intestine is then connected to the stomach pouch, leaving a small opening for food to travel. This procedure results in a sensation of satiety or fullness after eating small meals, and patients generally continue to feel full with small portions over the course of their lifetime. Most patients stay in the hospital one to two nights, recover quickly, and return to normal activity within 1-2 weeks. *results may vary. 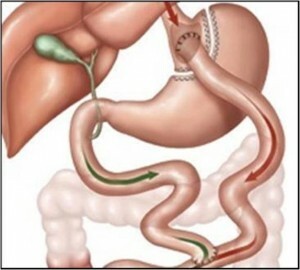 Roux-en-Y Gastric Bypass is Durable and Effective For the Long Term. 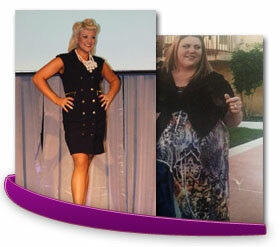 Roux-en-Y gastric bypass has been the most widely performed bariatric procedure in the United States for many years. Many long-term studies now demonstrate that the procedure is a durable and effective aid to long-term weight loss, health, and improved longevity. Most patients experience rapid weight loss immediately after surgery and continue to lose weight over the next 18 to 24 months. * Most studies, and the extensive data at Western Bariatric Institute, show that over 95% of people succeed in significant weight loss and health improvement. * Numerous studies indicate that heart problems, lung problems, diabetes, hypertension, obstructive sleep apnea and painful musculoskeletal problems improve in a high fraction of patients who have undergone Roux-en-Y gastric bypass. *results may vary. Who Is A Candidate for the Roux-en-Y Procedure? Western Bariatric Institute offers the laparoscopic Roux-en-Y gastric bypass to patients who meet the criteria established by the National Institutes of Health and the American Society for Bariatric and Metabolic Surgery. Namely, patients are candidates who have a Body Mass Index from 35-39.9 and suffer from any health condition related to obesity. Anyone with a BMI of 40 or more, regardless of health conditions, is a candidate. Some people are not candidates for the Roux-en-Y gastric bypass due to other medical concerns. These should be discussed with your surgeon. 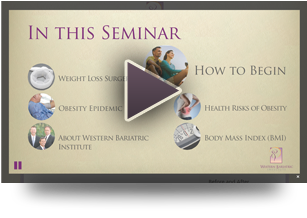 Watch our online seminar to learn more about all of the procedures we offer and watch animations of each one. Read about the Sleeve Gastrectomy or the Lap-Band.